While this method works best when used in collaboration with sunlight, it is still an effective solution for lightening dull locks. How to use: Fill a spray bottle with lemon juice and water. Spray mix on hair in areas that you wish to be lightened. Go outside and enjoy a sunny day! Chamomile tea has an incredible way of adding golden tones to hair, while the tea’s natural chemicals and flowers work together to expose and enhance lighter tones in the hair. Added bonus – chamomile can also aid in repairing split ends! How to use: Boil a bowl of chamomile tea (I suggest using three or four bags). Let tea cool so that you don’t end up with a burnt scalp! Once cooled, rinse hair with tea, making sure to catch the tea with a second bowl. Use recycled tea to repeat as desired. 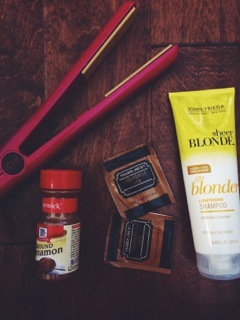 Cinnamon contains a natural peroxide that doesn’t dry out hair. This method takes a little bit longer than others, but if you have a few hours to kill or want to try the method overnight, go ahead and give it a try. How to use: Cover hair with conditioner. Make a mixture of cinnamon and water. Coat hair with the mixture. Leave in overnight, or for about four hours, and rinse. Okay, so this method is not so much a DIY, but it is cheap and effective! I love this product. I feel I can visibly notice a difference in my hair after one wash. Go Blonder shampoo and conditioner lightens and nourishes hair, to keep your locks sun kissed all year. Plus, it’s only $5.99 at Ulta. I mean, us college kids love a cheap deal, huh? How to use: Lather, rinse and repeat. When using conditioner, let sit for two or three minutes before rinsing.